I could not put this book down. Superb. This book goes to MaaikeB, who had it on her wishlist. Almost forgot to make a journal entry, because my husband grabbed the book from my hands as soon as I came home and abducted it to his side of the bed. He's halfway through, already, and seems to like it very much. Good for him, because I had to take The Da Vinci Code away from him before he'd had the chance to read the final chapters... Maybe this will convince him to finally become a bookcrosser himself? Hierna is de ray gesloten en reist het boek op eigen houtje verder. 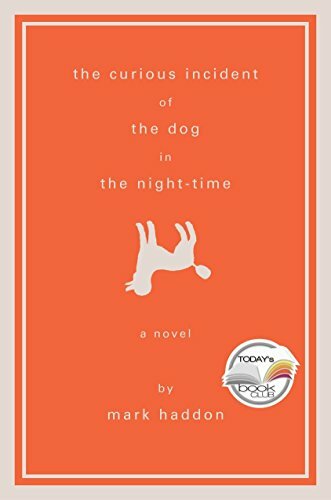 Maaike bracht Mark Haddon mee en ik had tussen de bedrijven door al even gelegenheid om aan dit boek te snuffelen. Feest van herkenning! Prachtig boekje. Ik had niet altijd zin om Christophers wiskundige redeneringen met 100% aandacht te volgen, maar alles eromheen boeide me enorm. Wat een ontroerend boek. Heel blij dat ik het gelezen heb. Denk nu iets meegeleefd te hebben van een mogelijke verschijningsvorm van autisme, dat is ook nog mooi meegenomen. Prachtig ook hoe je eerder dan Christopher overziet wat de situatie is, ook al krijg je het door C.'s ogen voorgeschoteld. Gisteravond door anness in mijn brievenbus gestopt. Ben erg benieuwd, bedankt voor het delen! Found it in my doorway, must have been put there by anness. Looking forward to reading this, because I've heard so much about it. Thanks for sharing! I loved this, finished it in a few hours, couldn't put it down! I really enjoyed the way this book gives an insight in the mind of someone who thinks in a different way. A very interesting book, and really up to my expectations and more! What a superb book! Fascinating. I liked the story, I liked the style and I couldn't put the book down. I needed that, 'cause I had some very disturbed relationships with books recently. I loved the ending - it was so wholeheartedly selfcentered, so Christopher-focused and the rest doesn't matter. It made me kind of jealous. Wish I could be a little, little bit like that. The book travels on to Afineke. Received this book last week from Yvonne. This is my first bookcrossing experience and my first bookray. Thanks, Maaike for starting this! I will tell you about my reading experience when I have read it and will then pass it on to Ineke. I finished this book in one evening, could not put it down. Christopher's world is so different from ours and yet it is so recognizable. His (day)dream about a world without any people but with animals in it. It would all be so much simpler. Yet he has to live in the world, has to cope with other people. But he is brave and manages it all. The end is hopeful for both Christopher and his parents. Being a mother I wondered what I would have done, how I would have reacted if one of my children turned out to be like Christopher. Would I have had the patience? I am sending this book on to Ineke and are looking forward to hearing from her about her experience with this book. What a wonderful book. It was a pity I knew about the syndrome, I'm curious how quick I should have guessed. Page 1, was already pretty clear, but page 2 and 3 were obvious. And yet should I have known that quick. It was very clever to keep Christophers view, without becoming dull, or without explaining to much. A real pageturner. I'm sending it to Eleonoor, so she will find it when she returns from 'De Wadden'. 'The dog' was laying in wait for me when I returned from holiday and is ready to travel on after just one day, because I was one of many readers who couldn't put the book down. It's a magnificent story, full of wit, suspense, love and understanding. Thanks for starting this ray! This arrived in the mail. Look, I can start right away! I am lloking forward to it very much. I could not put it down, this book. This Christopher voice is amazing. Here's how he feels about animals: '"I like dogs. You always know what a dog is thinking. It has four moods. Happy, sad, cross and concentrating. Also, dogs are faithful and they do not tell lies because they cannot talk." It was quite fascinating to view the world through the eyes of someone who takes the world completely literal. And I admired his courage. Released on Monday, August 16, 2004 at Controlled Release in Controlled Release, Controlled Release Controlled Releases. This curious incident travels to Marjo. Thanks, MaaikeB, for her address. Ben ik nou de enige met kanttekeningen? Het was aardig..meer niet. Natuurlijk is het interessant om te lezen hoe een autist de wereld beleeft, maar het verhaal bleef niet boeien. Op een gegeven moment dacht ik "nou weet ik het wel", de spanningsboog was gebroken, en keerde niet terug.. Yet another ring! En wát een enthousiaste verhalen. Wordt toegevoegd aan het gebergte 'te lezen'. O, o, o, wat ben ik onder de indruk. Ik ben nu halverwege, maar twee dingen weet ik zeker. Ik ga het in mijn omgeving een ieder aanraden die iets te maken heeft met mensen met een stoornis in het autistisch spectrum en ik ga het kopen. Wat een prachtig boekje. Om te hebben. En uit. Prachtig boekje, pareltje. Ik ken diverse mensen met een Asperger-achtig iets en, hoewel me Cristopher wat extreem voorkomt, ik heb echt het gevoel gekregen dat dit boek over hen gaat. Ieder mens heeft recht op z'n eigen tics en de mijne is dat ik niet van Amerikaanse boeken houd, zeker niet als ze door Britten geschreven zijn. Ik heb dan ook een Britse paperback gekocht. Want dit boek gaat de kast in, zeker weten. Het rode boekje bleek best kwetsbaar. Een van mijn voor-lezers had het liefdevol verpakt in het cellofaantje van een wenskaar. Ik heb de vrijheid genomen het boek te plasticeren. Op naar Fenna, nu. A very thick envelope was pushed through the opening in my letterbox. When I opened it: hurray! A very welcome book (the curious incident of the dog in the nigth-time) was in the envelope! The bookgrrls have been talking so much about this novel, I can't wait to start reading! Thnx Willemijn, for sending me this copy! This book is great! I heard so much about it that I was dying to read it. Well, it defenitely was worth waiting for. Christopher is so cute (if that is the correct word in English, can´t find my dictionary at the moment, the Dutch word is: ontroerend), but I can imagine that living with such a child is extremely exhausting. I loved the numbering of the chapters (in prime numbers). The strange things about food, colours, numbers. Trying to get everyting into some kind of logical scheme, makes Christopher feel safe: schemes are something he can relate to. Emotions aren´t. ´Because time is not like space. And when you put something down somewhere (...), you can have a map in your head to tell you where you have left it, but even if you don´t have a map it will still be there because a map is a representation of things that actually exist (...). And a timetable is a map of time, (...). And this is why I like timetables, because they make sure you don´t get lost in time. Jesi, morgen gaat The curious incident op weg naar jou toe! I just received the book by mail. Thanx! I will read it soon, so a report on it can be expected soon as well. I have already requested rubyblues address but have not had any response yet. Meanwhile I am going to read it again, and then send it off to her! Released on Saturday, November 20, 2004 at about 8:00:00 AM BX time (GMT-06:00) Central Time (US & Canada) at Mailed to BC member in Mailed to another BC member, a fellow bookcrosser Controlled Releases. I sent the book off to Rubyblue.. I found this book on the inside door mat yesterday. I'm delighted to see that I am the last person on the list for this book ray BECAUSE I thinkit might be a book mydaughter will want to read. At 17 she has never displayed any evidence that she might have inherited the reading gene from either me or her father. But for some reason, a few months ago, when I was reading "Everything is Illuminated," she became curious about that book. I didn't realize she wanted to read it and sent it off as a RABCK to someone in the Ukraine (and haven't heard since that they even received the book). A few weeks ago, while shopping in Zwolle, of course I had to stop by de Slegte and she followed me. When we got to the kassa, she noticed a pile of "Everything is Illuminated" on sale . . . and said she wanted it. So, she--the girl who says she hates books and reading (mostly because she has so much required reading to do for school) is reading "EIL" (she calls it "Everything is Discombubulated). I have reason to believe that if I leave "TCIOTDITNT" lying around she may also be tempted to see what this one is about. So, thank goodness no one is waiting for it. Bedankt, BookCrosser. Released on Saturday, December 11, 2004 at about 7:00:00 AM BX time (GMT-06:00) Central Time (US & Canada) at Café Ipanema (Bonnefantenmuseum), Avenue Céramique in Maastricht, Limburg Netherlands. Thanks, bookcrosser. I'm glad I read the book, but somehow just wasn't as impressed as some of the other readers in this bookray. Perhaps it should have been a (rather long) short story. Some good bits, probably the thing I liked best is on p. 64, where it is explained how to determine which door to pick . . . on what was the name of that game show? Since I'm the last person in the ray, I'm releasing the book today in Maastricht at the euro-region BookCrossing meeting--should be leaving in 45 minutes. And writing in haste, thus this journal entry is rather superficial. HA! The book everybody has been talking about since I became a bookcrosser, found even without signing in (up?) for a ring! Great! Fascinating book, but not the great award-winning eye opener I expected after all the praise I read and heared about it. I'm afraid I would not have the patience to live with Christopher! I will hand the book to Mopperhond shortly, and she will pass it on to the next reader. Ik heb dit boek al gelezen en vond het erg mooi geschreven. Fascinerend hoe een autistische jongen denkt. Ik heb gevraagd om dit exemplaar omdat ik het wil doorgeven aan iemand die het ook graag wil lezen. Doorgegeven aan iemand die dit boek graag wil lezen. Wie wordt ze ook wel BC-er ..?